On April 9, 1967, the Boeing 737 made its first flight, and would go on to become the biggest selling jet airliner of all time, with over 9400 built and 50 years later it is still in production! Over 4400 of the latest generation are on order at this time. Brought to you by Boeing, an airplane manufacturer famous for building major US bomber aircraft as well as the premier airliner manufacturer in the world, the 737 does not have the massive size, range, or capacity of the jumbo jets that get so much more attention. A medium sized short to medium range narrow body jet, the 737 has a single engine slung under each wing and can carry up to 215 passengers, though the smallest models carried only 85 people. Initial examples cost only $32 million each, but over 50 years of production and numerous improvements, the current price is now $101 million. For all those extra dollars you get an airliner that can fly 3800 nautical miles, compared to 1540 nautical miles for the original model. The newest engines are twice as powerful (28,000 pounds of thrust apiece) as the original engines and provide better fuel efficiency as well. Passenger capacity has grown, fuel capacity has grown, and top speed has increased a bit. Numerous improvements enhancing efficiency and safety have been made over the years, and the jet is flown by a remarkable 500 airlines! The 737 is so ubiquitous that they fly to 190 countries and account for more than a quarter of all jet airliners in the world. How much of a workhorse have these planes been? How about carrying over 12 billion passengers over 74 billion miles, with nearly 300 million flight hours? 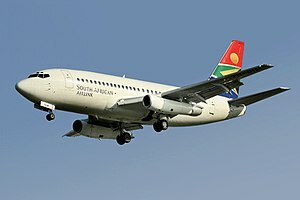 It was estimated in 2006 that somewhere in the world, a 737 was either taking off or landing every 5 seconds. Of course, a jetliner so common had to have some sort of military capability, and 19 of these jets were built for the US Air Force as the T-43, a training jet for navigators. Those were retired in 2010. USAF T-43 navigator trainer. The T-43A is a medium-range, swept-wing jet aircraft equipped with modern navigation and communications equipment to train navigators for strategic and tactical aircraft. The T-43A is primarily used in the Air Force’s undergraduate navigator training program. Several T-43s are configured for passengers and provide operational support to assigned commands and the Air National Guard. Changes to the 737 have included new quieter and more powerful engines, redesigned engine nacelles, longer and improved wings with winglets at the tip, updated interiors, improved electronics, improved cockpit glass, longer fuselage, wider fuselage (in the middle), improved rough field and short take off capability, more on board fuel, redesigned leading edge slat, flaps, and tail fin, larger cargo door for pallets, decreased drag and innumerable other changes. These improvements have allowed this jet the rare opportunity to be in production for 50 years and counting! Have you flown on a 737? If you’ve flown more than once or twice on airliners chances are pretty good you have. Chances are also good that you survived the flight, because the 737 was rated as the safest airliner in the world in 2015. If you have any interesting 737 or other jetliner stories, please share them with us in the comments. Dornseif, Daniel. Boeing 737: The World’s Jetliner. Schiffer, 2017. Previous ArticleApril 8, 1935: Parents Are Wrong About SO MANY Things! Next Article April 10, 1916: Today is Golfer’s Day!